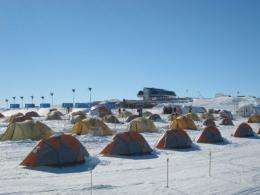 A village of tents, where scientist sleep, is seen in front of the Belgian Princess Elisabeth polar station in Usteinen, Antarctica in 2009. The United States and Russia will jointly inspect foreign facilities in Antarctica to make sure environmental and other responsibilities under the 1959 Antarctica Treaty are being met, the State Department said Saturday. A US-Russian team will travel to Antarctica January 23-28 to check foreign stations, installations and equipment, it said. "The US-Russian team will review adherence by treaty parties to their obligations, including with respect to limiting environmental impacts, ensuring that Antarctica is used only for peaceful purposes and that parties honor the prohibition on measures of a military nature," it said. This would be the first joint inspection ever by either country to review compliance with the 1959 treaty and its environmental protocol. The last US inspection was in 2006. Currently 49 nations are signatories of the treaty, which sets aside Antarctica as a scientific preserve where military activity is banned. Signed in 1991, the environmental protocol provides for environmental impact assessments and waste management, and designates protected areas in order to safeguard the pristine region's marine environment and its flora and fauna. I admire the effort, but question the sincerity. Imagine that there was a huge world of undiscovered mineral resources lying just under the surface of the continent. Hahaha the Russians should inspect their own facilities!